This extension allows you to browse ev3dev devices from Visual Studio Code, send files to these devices and remotely run programs. Learn more about ev3dev at http://www.ev3dev.org. This extension is only compatible with devices running ev3dev-stretch. It will not work with earlier versions of ev3dev. Additional information can be found on the wiki. Discover devices: Any connected ev3dev device should be automatically discovered. No configuration necessary. Remotely browse files: Files for each device are listed just as they are in Brickman. Download files to the device: The current VS Code project can be sent to an ev3dev device with a single click. Remotely run programs: Click any executable file to run it. Error messages will be displayed in the output pane. Build, Download and Run with a single click (or F5): Create a launch.json file with an "ev3devBrowser" type to use this feature. Start a remote SSH session: You can start an SSH session in the terminal pane by right-clicking on a device. Take a screenshot: You can easily take screenshot by right-clicking a device. ev3devBrowser.password: If you changed the password on your ev3dev device, you will need to set the password here. If you want to manually enter the password when you connect or use public key authentication, set this to null. ev3devBrowser.env: If you need to set environment variables for running remote programs, you can set them here. Each variable is defined as a key/value pair. ev3devBrowser.download.include: Use this to specify which files to included when downloading files to the remote device. Can use glob patterns. ev3devBrowser.download.exclude: Use this to specify which files to exclude when downloading files to the remote device. Can use glob patterns. ev3devBrowser.download.directory: By default files are downloaded to a folder with the same name as the VS Code project. Use this setting to save the project files somewhere else. Paths are relative to the /home/robot directory. 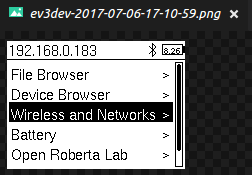 ev3devBrowser.additionalDevices: A list of additional devices to show in the list when connecting to a device. This should only be needed in cases where there are network problems interfering with device discover. ev3devBrowser.confirmDelete: Setting to false will suppress the confirmation message when deleting a remote file or directory. More details and examples on the wiki.